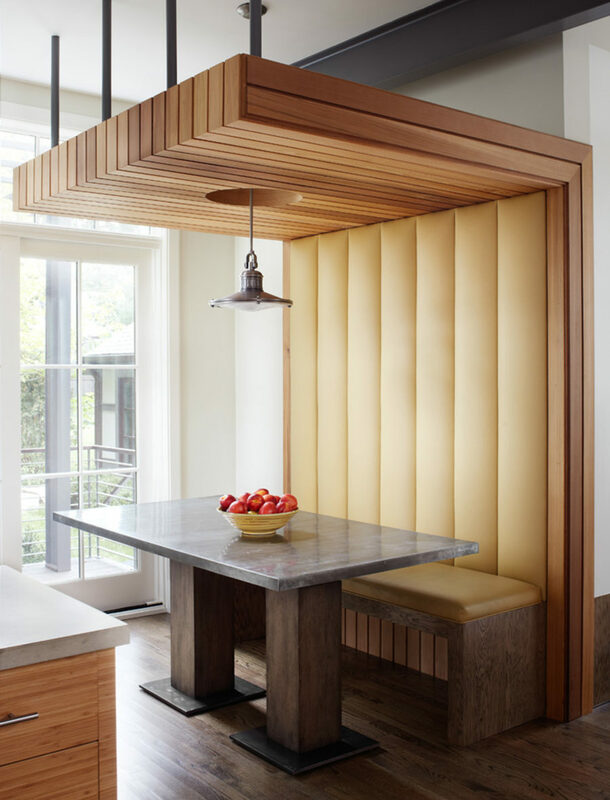 All year long we’ve been celebrating the thirtieth anniversary of Morgante Wilson Architects by sharing some of our best residential architecture and interior design ideas with you. But as it turns out, picking just a few favorite ideas is kind of like choosing a favorite child; it simply can’t be done. 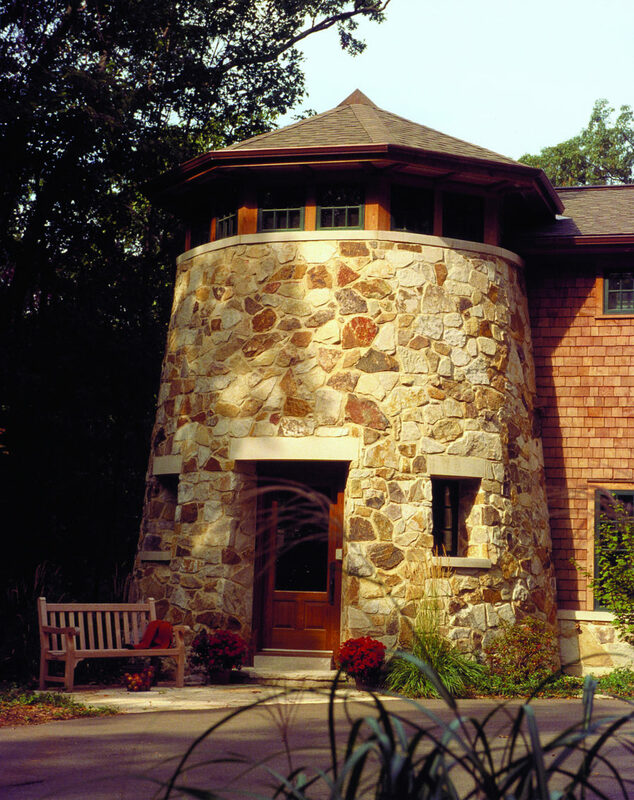 Every project our team of residential architects has worked on over the last thirty years is unique, and each one incorporates ideas we still love to this day. So to mark the end of our Thirty Years, Thirty Ideas series, we’re going out with a bang – kind of like on the Fourth of July, when you think the fireworks are over but then there’s one last enormous burst you didn’t expect. Our surprise is a burst of creative ways to think about architecture, interior design, color, space, texture…the list goes on! 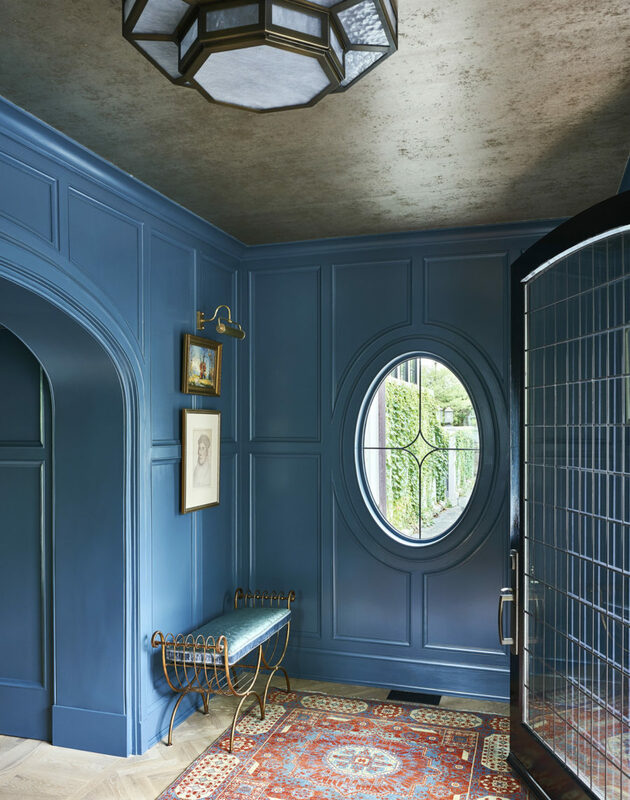 We love the dichotomy between this entry hall’s oval window and the square grid pattern of its door. The shapely variations play off one another to terrific effect and heighten the visual excitement. Of course, those deep blue walls don’t hurt either! In our view ceilings - the fifth surface in any room - deserve as much attention as walls and floors. 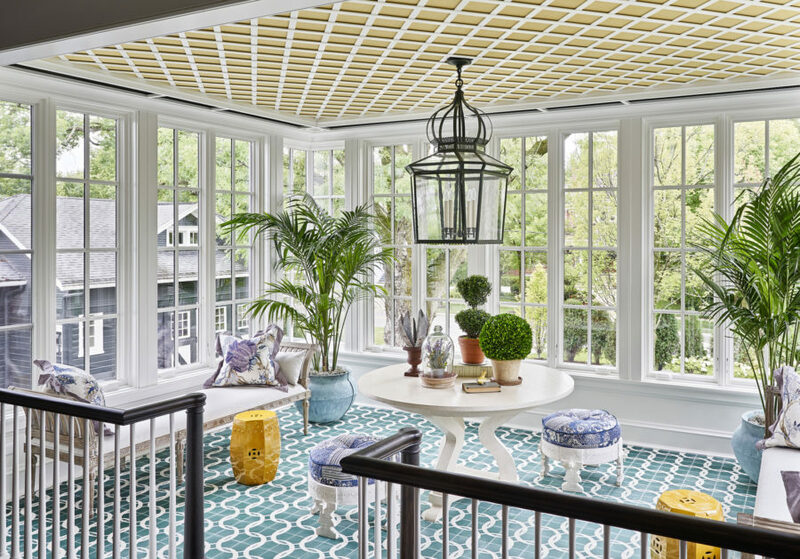 This lattice treatment heightens the garden room-feel of an upper stair landing and really brings the outdoors in. One of the (many!) benefits of working with a residential architect is the opportunity to infuse a house with amazing detail. 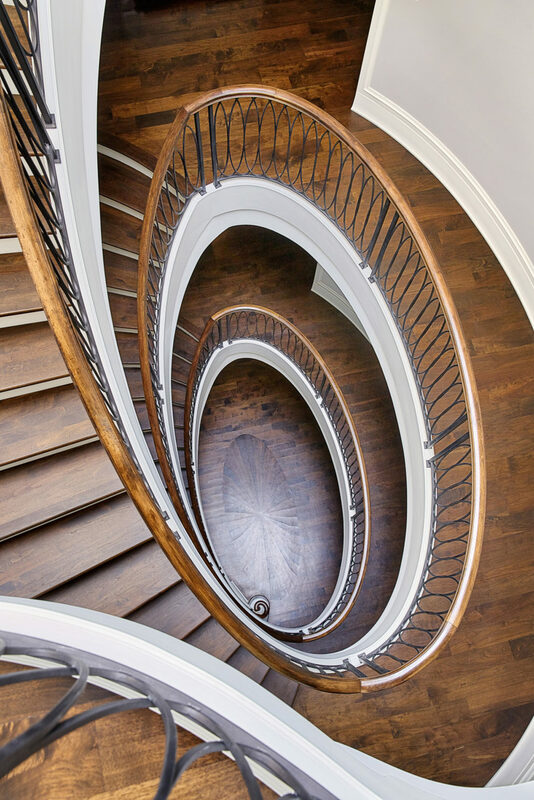 This multi-level stairway is a prime example: notice all the elliptical shapes at play, from the floor inlay at its base to the custom-crafted iron ellipses accenting its banister. 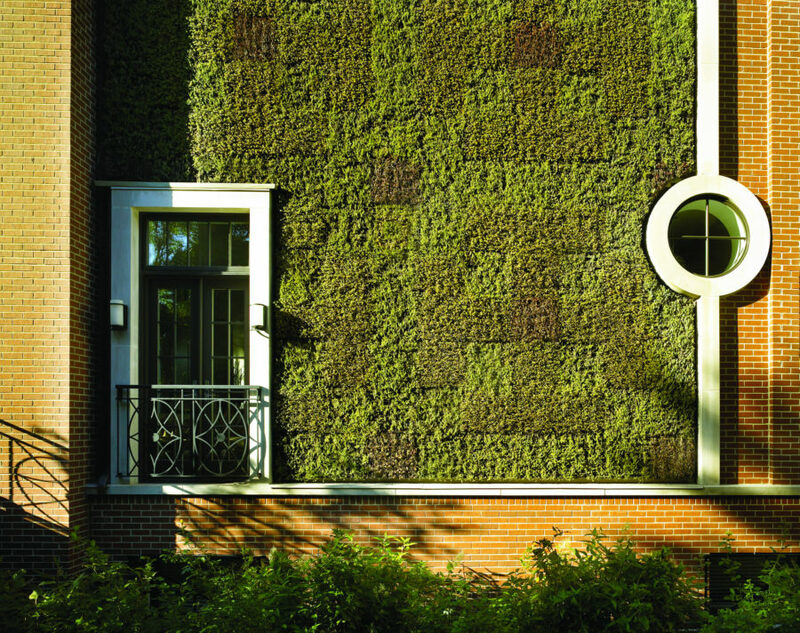 We’re huge fans of architectural repetition. 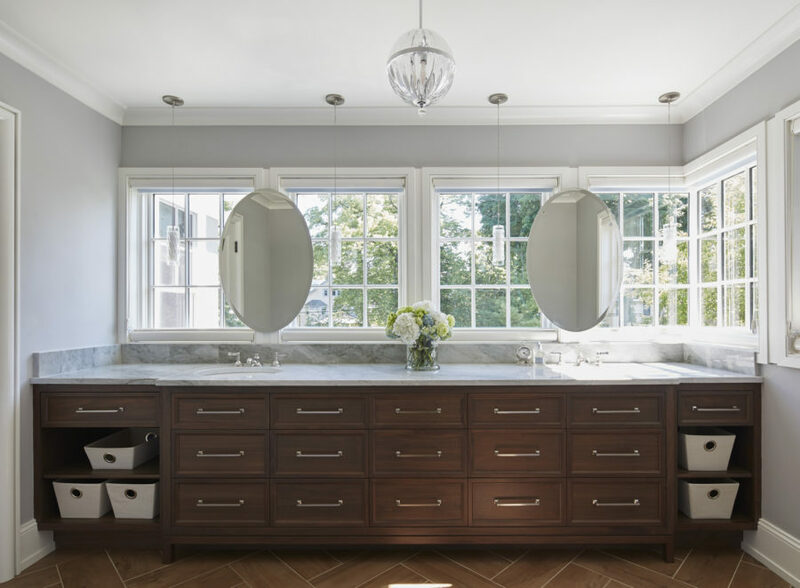 The gently arches that embellish this timeless master bath can be seen throughout this gracious home – they define doorways, top windows, surround fireplaces, cap built-ins…..you get the idea! We suggest to all our clients that they extend living space outdoors if space and budget allow. We know of no greater way to maximize enjoyment of a home than to allow daily life to spill outdoors. It may seem counter-intuitive, but we love wrapping smaller spaces in deep, dark color to amplify their coziness – ceilings included (because you already know how we feel about that fifth surface). Another of our favorite things to do is make an entrance. To us, setting the tone right at the front door not only ups a home’s curb appeal, it announces the visual delights waiting to be discovered just over the threshold. We’re big fans of utilizing multiple finishes on kitchen cabinets. Here, white painted cabinets combine with smoky-toned, glass-front display and the island’s stained wood base. The blend makes a beautiful room even more interesting. Decades ago we began hanging bathroom mirrors directly over windows, and it’s a trick we still love to employ today. 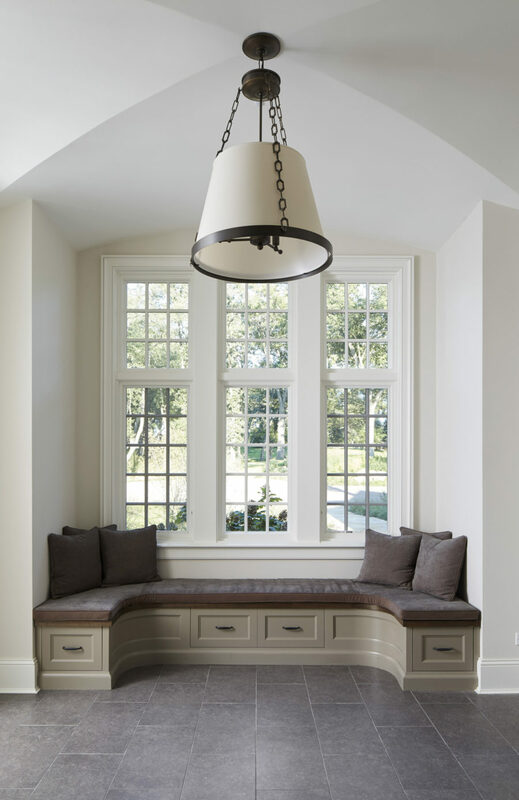 There’s no better way to welcome soothing outdoor views and bounce natural light around a room. Ah, where to begin? 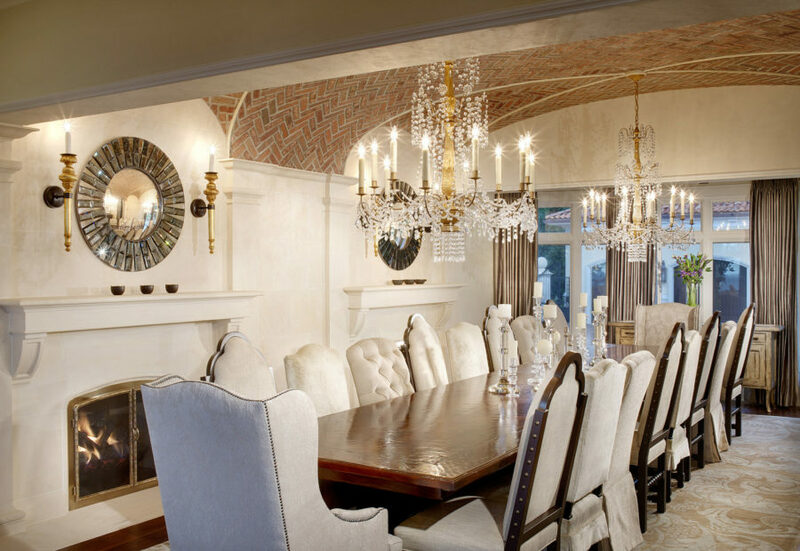 This dining room combines three of our favorite moves: a blend of not-quite-matching chairs settles in front of a luxurious fireplace, all beneath a texture-rich, barrel-vaulted brick ceiling. 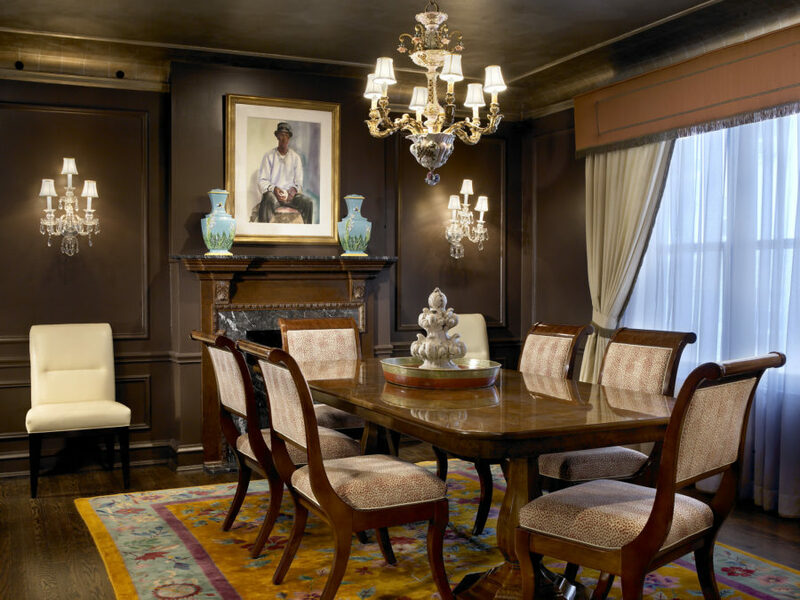 This has always been one of our favorite dining rooms – its warmth and romance are as welcoming today as when this home was first built. One of our most innovative projects ever, this LEED-certified home is designed around an interior courtyard visible from nearly every room. It offers the best of both worlds: indoor comfort and enjoyment of the outdoors, whether during a gentle snowfall, a dramatic thunderstorm, or a moonlit sky. 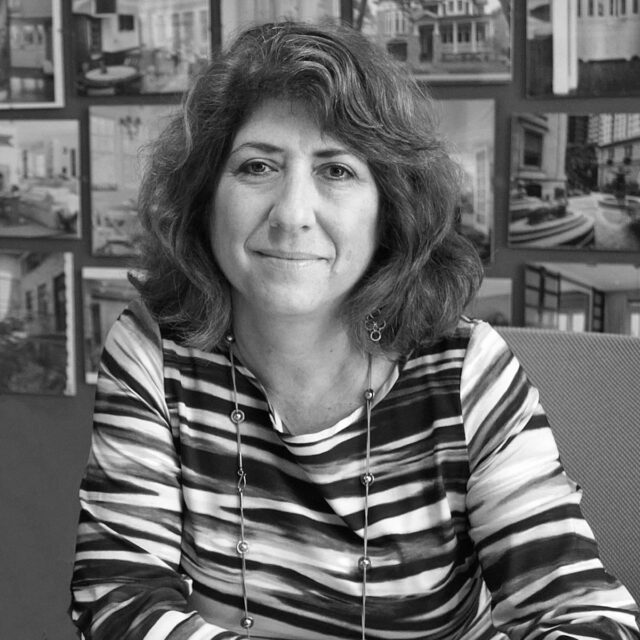 We talk often of the many, many good things that happen when architects and interior designers work hand-in-hand from the get-go. 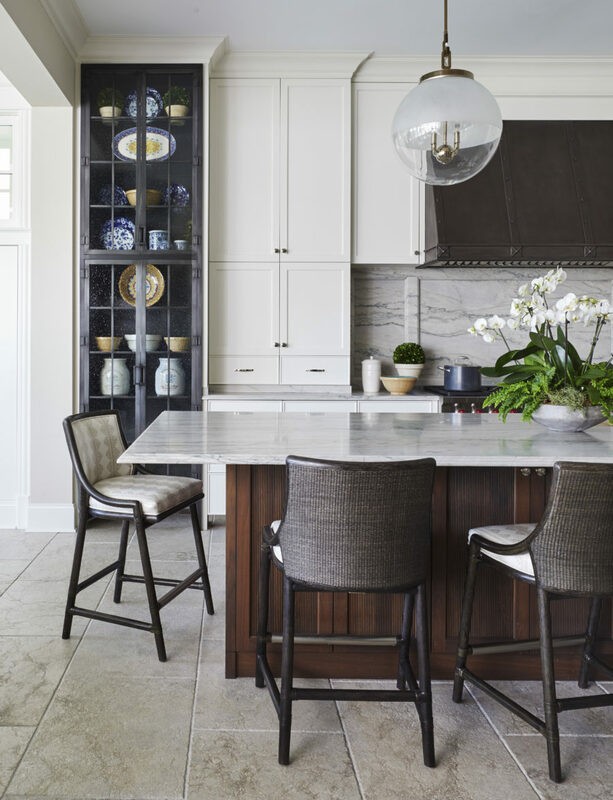 This dining area is a prime example: it features display niches planned from the outset to spotlight a collection of baskets gathered on world travels. Regular readers of this blog already know of our abiding love for bunk rooms. We consider them literally life-changing and enthusiastically recommend them to every client with children, grandchildren, or out- of-town family and friends. There is no easier way in the world to host overnight guests with minimum fuss. Another outdoor idea dear to our hearts: upper-level decks, comfortably furnished with weatherproof seating and shade-providing, retractable coverings. It’s like having your very own tree house! 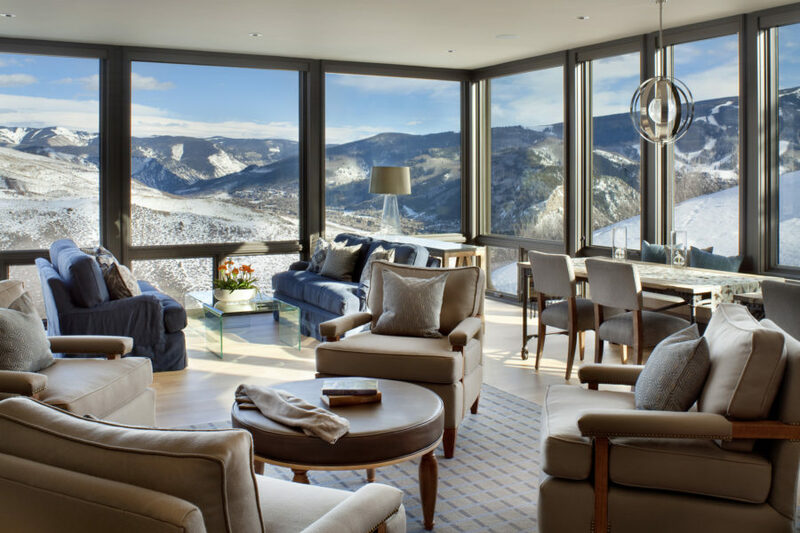 When your house features a view as spectacular as this, it’s time to let scenery take center stage and ensure furnishings keep a low profile. A professional interior designer will know exactly how to furnish for maximum comfort while keeping visual distraction to a minimum. Another favorite trick we’ve learned over the past thirty years is to furnish for flexibility. Here, the large square dining table is actually made up of four smaller, individual tables that break apart when necessary. Vacation homes such as this are ideal candidates for a similar approach to furniture planning. 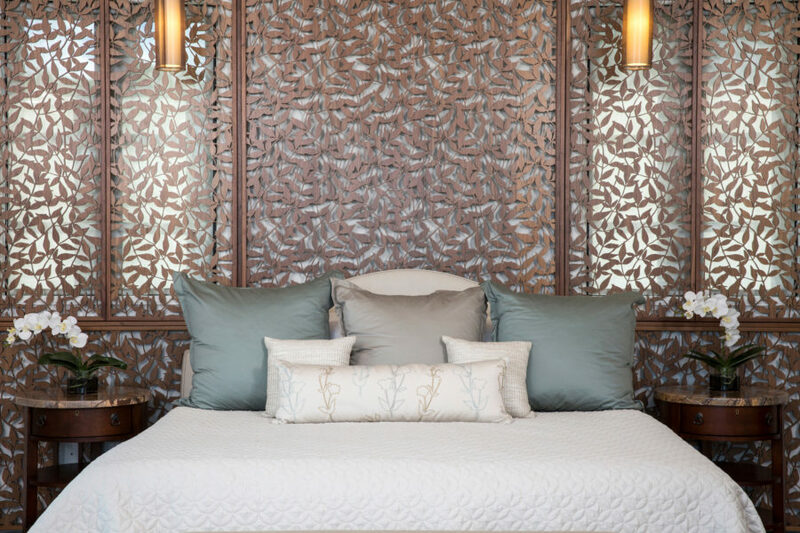 Finally, consider the dramatic possibilities of covering windows and walls not with fabric or paper, but intricately carved screens. This bedroom screen filters bright island light, but it could just as easily obscure a not-so-great view. We could go on and on, but you get the idea – or ideas! For more thought-provoking ways to make your house more stylish, more personal, more functional and more fun, head to our website. There you’ll see all we’ve been up to over the last thirty years – and how we keep evolving as our clients evolve. We hope you’ve enjoyed this series. And to all our clients past, present and future: thank you for joining us on our journey. We love what we do, and you’re the reason we do it! Morgante Wilson Architects provides architectural and interior design services in Chicago, Deerfield, Evanston, Glencoe, Glenview, Highland Park, Kenilworth, Lake Bluff, Lake Forest, Northbrook, Northfield, Ravinia, Wilmette and Winnetka – along with Colorado, Florida, Idaho, Indiana, Iowa, Michigan, New Hampshire, New York, Ohio, Utah, Wisconsin and the U.S. Virgin Islands.